Simply Business has revealed average value of stolen goods has risen to £1,692 as sophisticated thieves target higher value tools. Simply Business analysed over 3,000 tool theft claims and discovered that the average tool theft claim has gone up by over 15% from 2016 to 2017 – with five per cent of claims over £5,000, and some claims as high as £11,000. 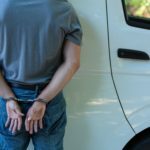 This reflects the trade community’s growing concerns over the safety of their equipment, as the Office of National Statistics this January reported an 18 per cent rise in vehicle-related thefts overall for 2017. In March, tradespeople in Plymouth marched in protest at a sharp increase in van tool thefts – thetotal costs of tool replacement, lost time and damaged client relationships all adding to the toll on tradespeople. 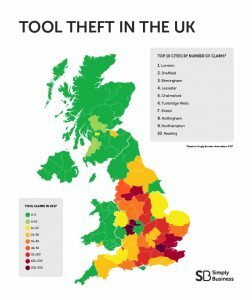 “Tool theft remains one of the number one issues affecting hard-working tradespeople across the country. Over the last year, we’ve seen an average of at least two or three tool theft claims every single day. Stolen tools can be devastating – beyond the financial loss, it takes away tradespeople’s ability to carry out their work, leading to loss of time and negatively impacting customer relationships too. “In 2016, a ‘peel and steal’ craze affected thousands across the country – now we are witnessing new and more advanced ways for thieves to target high-value items, which is a worrying trend. Electronic key fobs can be easily purchased for next to nothing online, leaving thousands of tradespeople vulnerable to theft. “Last year, thieves stole nearly £8,000 worth of tools from my van in the middle of the night. I saw them on CCTV break into my van an hour before I got up to leave for the day’s work. They broke in using an electronic key fob that can be bought for next to nothing online – and it’s hard to protect yourself against something like that. o Park for prevention. Try to park with sliding or rear doors against a wall or sturdy fence so that they can’t be opened. Busy, well-lit areas, preferably in view of a CCTV camera are best. o Store tools sensibly. It is best to remove tools from your van overnight as ‘peel and steal’ and electronic key fobs can leave even well-secured vans vulnerable. o Mark your property. If your tools are stolen, having identification marks on them will help make sure you’re recognised as the owner if they’re found. o Keep a note of serial numbers and other data. Providing information like serial number, or at least an itemised list with the make and model of everything taken, will help police identify your tools if they’re found as well as easing the process of making an insurance claim. o Check your insurance. If you don’t have tools insurance as part of your business insurance policy, consider adding it in. It can help pay for the cost of replacing your tools should they be stolen. You should also check your policy wording to find out exactly what’s covered, what the limits and excesses are, and if there are any conditions. For more of the latest news in the construction industry subscribe to our weekly newsletter here. Next : Gold Classic 2018: Competition Heating Up!